On 28th January, HH Indradyumna Swami Maharaj gave a lecture on Srimad Bhagwatam 6.3.26. Below is the transcript of the lecture. Hare Krishna! This morning we are reading from Granthraj Srimad Bhagavatam Canto Six, Chapter Three entitled “Yamaraja instructs his messengers”, Text 26. (invocation prayers) evam vimrsya sudhiyo bhagavaty anante sarvatmana vidadhate khalu bhava-yogam te me na dandam arhanty atha yady amisam syat patakam tad api hanty urugaya-vadah Translation: “Considering all these points, therefore, intelligent men decide to solve all problems by adopting the devotional service of chanting the holy name of the Lord, who is situated in everyone’s heart and who is a mine of all auspicious qualities. Such persons are not within my jurisdiction for punishment. Generally they never commit sinful activities, but even if by mistake or because of bewilderment or illusion they sometimes commit sinful acts, they are protected from sinful reactions because they always chant the Hare Krsna mantra.” HH Indradyumna Swami : So if you were listening carefully, you will understand there are many, a number of very important points in the verse and Srila Prabhupada’s purport and his explanation of the verse today. The first thing that comes to mind is the first point that Yamaraj is stressing “evam vimrsya sudhiyo bhagavaty anante” which means that all problems are solved by devotional service. And he explains that devotional service, interestingly enough, as the chanting of the holy names of the Lord. So in this age, that means the chanting of the Hare Krishna maha-mantra. In twelfth Canto of this great work Srimad Bhagavatam it is stated, krte yad dhyayato visnum tretayam yajato makhaih dvapare paricaryayam kalau tad dhari-kirtanat (SB 12.3.52) A famous verse amongst kirtaniya’s. Whatever results was attained in Satya yuga by meditating on Visnu, in the Treta yuga by performing agnihotra’s or sacrifices and in Dvapara yuga by serving the Lord’s lotus feet which meant technically going to the temple, can be obtained in Kali yuga simply by chanting the Hare Krishna maha-mantra. So the conclusion is that to solve all problems of life we simply need to chant Hare Krishna Hare Krishna Krishna Krishna Hare Hare, Hare Rama Hare Rama Rama Rama Hare Hare It may seem almost too simple to the non-devotees but they have a saying “nice things come in small packages “. It is interesting to note that although the Lord has unlimited names. We hear that Ananta Sesa from time immemorial, which means eternity, one of his seva’s or one of his service’s is to always be glorifying the Lord by chanting His holy names and he has never chanted the same name twice. Since the beginning of creation Ananta Sesa is chanting various names of the Supreme Personality of Godhead, which correspond to His personality, His characteristics, His pastimes, etc. So there is unlimited names of the Lord. But we are instructed in that particular verse from the Twelfth Canto and other verses as well and by the most recent incarnation of the Lord, Caitanya Mahaprabhu, and our acaryas to chant Krishna’s name. If all the names of God are Absolute, why then do we chant the name of Krishna in the Hare Krishna maha-mantra? There is a number of reasons for this. Actually Srila Bhaktivinoda Thakura has illuminated this subject matter, enlightened us in this subject matter. He has described that although all the names of Krishna are Absolute, nama cintamanih krsnas caitanya-rasa-vigrahah (Padma Purana), they are all non different from the Lord. Some names he describes he uses the word primary and other names he describes as secondary. Another way to say this is that some names of God are of the utmost importance and some of them may be of lesser importance. Of course, no name of God is less important but the idea is that some names of God have more power and more potency than others. For example in the Visnu Purana its stated that one thousand names of Visnu are equal to one name of Rama and three names of Rama are equal to one name of Krishna. There’s an example. Some names have more potency. The name of Krishna has full potency and Bhaktivinoda Thakura writes that the secondary names essentially describe the greatness of God like Maha Visnu. Visnu denotes Krishna and His expansion is Narayana Visnu and maha means great like we say ‘maha prasadam’. We have prasadam, but we have ‘great prasadam’, (laughs) great mercy when it comes off the altar from the deities. So Maha Visnu. This is the name of the Lord which denotes His greatness. And Paramatma, the Supersoul. These are secondary names of the Lord. Or we could even go so far as to say, we can be liberal and respect our Christian brothers and sisters, and Muslim brothers and sisters and Buddhists, although they are impersonalits, voidists. But still, Allah means the ‘great one’ – al akbar hamdullah – is that correct ? al akbar hamdullah – ‘God is great’ or as they say ‘there is no God but Allah and Mohammed is His prophet .’ This was one mantra that I learnt in the early 90’s. It got me out of some very difficult situations when I was travelling in Muslim countries. I would come in non-devotional dress, you know and they would be a little suspicious, you know finding saffron cloth in my bag and my neck beads tucked underneath, you know, whatever. They would get a little suspicious, ‘who are you?” – al akbar hamdullah- all right! You can go! (laughter) this was one good mantra! And Buddha means the, actually technically it means the intelligent one because we have buddhi which means intelligence. As human beings we are distinguished from all other created beings as we have buddhi, intelligence. Krishna say, “One who reads this Gita, worships Me with intelligence. “ So Buddha means the intelligent one or one who has utilized his intelligence to perfection and become enlightened. This is the real use of the intelligence, to utilize it to become Krishna conscious, Buddha. So these are different names, secondary names, Bhaktivinoda Thakura says, which indicate the power or the majesty or the awesomeness of God. Like today in modern society there is a word – oh! That’s awesome! – so the awesomeness, no one can be more awesome than the Lord Himself. But then he describes the primary, the first most important name, he said like Yasodanandana, Gopijanavallabha, Girivaradhari. He said that these names have more potency because they reveal the very sweet and confidential nature of God, of His characteristics, His pastimes, in particular His pastimes in Vrindavana. The result of chanting such primary names of God, more intimate names of God is very nicely described by Srila Rupa Goswami in his compilation of verses called Padyavali. Padyavali is a very wonderful book for shlokawallas. What is a shlokawallah, devotees like Vaisesika Prabhu my God brother who loves to learn and quote Sanskrit verses. His classes are just full of many wonderful verses, following in the footsteps of Srila Prabhupada. Even quotes verses to the non-devotees in the street when he is distributing books to serve the authority of Krishna consciousness. So one time I was at his home and I was looking around at his things in his room and I found his verse book. It was this thick (laughter), and I was really impressed. So Srila Rupa Goswami, whom Mahaprabhu instructed to go through all the Vedic literatures and determine, or conclude, or prove, that Krishna is the Supreme Personality of Godhead, isvarah paramah krsnah sac-cid-ananda-vigrahah anadir adir govindah sarva-karana-karanam (BS 5.1) He actually went through all the Upanishads, Itihasa’s ands the Purana’s and took out the select verses to show who is the Supreme Personality of Godhead and then he wrote his Bhakti sastra’s. So in doing so he discovered many nice verses which he personally liked and he wrote them down with his iron pen, put them on the palm leaves and that became Padyavali, his personal verse book and I carry that book with me because he is śrī-caitanya-mano-’bhīṣṭaṁ. He is a special personality because he understood the mind of Caitanya Mahaprabhu, he understood the heart of Caitanya Mahaprabhu, he understood the mood of Sri Caitanya Mahaprabhu, number one in establishing the chanting of the Hare Krishna as the yuga dharma and number two that Mahaprabhu was in the mood of Radharani, of Krishna trying to understand Radharani’s mood of love for Krishna . So he wrote very nice verse which describes the effect of chanting these primary names, not the secondary names, with all due respect, but the primary names. What happens? He writes : “May my respectful obeisances be given to the shoes of those wise entities who have learnt the technique of liberating the poor creatures who are caught in the stinking mud of the ocean of material existence. On simply hearing the two syllable of Krishna’s name , these devotees are overcome with bliss and their bodily hairs stand erect. “ So chanting the secondary names of God awakens in us an appreciation of the awesomeness of God, which is part of our process. Actually we worship Radha and Krishna in the mood of Lakshmi Narayana in full opulence but culminating in pure devotion to the Lord. So its important to chant the secondary names as well to appreciate how great God is. But chanting the primary names of God, His names in Vrindavana are special because it awakens a deep love for the Lord. And of all primary names of God the most important is God’s original name. What is His original name? We have to go to His home town Vrindavana and there His devotees call Him by His original name. Therefore it’s the most important name, Krishna. And this is not just our biased opinion because we are Krishna bhaktas. No, its stated in sastra. In his commentary on the Sri Visnu Sahasranama Stotra, which is the thousand names of Visnu, Srila Baladeva Vidyabhusana who was an illustrious disciple of Srila Visvanath Cakravarti Thakura and to whom Srila Prabhupada dedicates his translation of the Bhagavad Gita, to his Govinda bhasya, he glorifies, Srila Baladeva Vidyabhusana. So in his commentary of Sri Visnu Sahasranama Stotra, Srila Baladeva Vidyabhusana states very clearly that for Gaudiya Vaisnavas the name of Krishna is the most important name. He says, “ Of all the names of the Supreme Personality of Godhead Krishna is the most important as the Lord Himself has confirmed by saying, ‘ My dear Arjuna, Krishna is the most important of My names.’” There you go, from the Lord Himself. Baladeva Vidyabhusana gives a quote he says, ‘of all these names….’ But then to give authority to his statement he quotes the Lord. The Lord says, ‘ My dear Arjuna, Krishna is the most important of My names.’ This is in a commentary on the Visnu Sahasranama Stotra, I found out. So interesting! So Krishna is the primary name of the primary names. And by His causeless mercy that name Krishna, which has several translations, the most attractive person. Rupa Goswami also gives another translation of Krishna’s name. Krishna means – He who frees you from the repetition of birth and death. So that name is so important that it descends as a veritable incarnation in the age of Kali. Narottama says, goloka premdhana harinama sankirtana, this harinama sankirtana composed of chanting, Hare Krishna Hare Krishna Krishna Krishna Hare Hare, Hare Rama Hare Rama Rama Rama Hare Hare Where does it come from? goloka premdhana harinama sankirtana, it comes from Goloka, it comes from the topmost planet in the spiritual world. So its an avatar. What’s an avatar? Avatar is not a movie. (laughter). No, avatar is a word in Sanskrit which means ‘He who descends from the spiritual realm’, either the Lord or His representative, His pure devotee. The Lord comes in various incarnations, ete camsa-kalah pumsah krsnas tu bhagavan svayam indrari-vyakulam lokam mrdayanti yuge yuge (SB 1.3.28) Unlimited incarnations. His pure devotees also come. I was listening recently to a class of my God brother HH Gaur Govinda Maharaj. And he said there is two types of pure devotees who come from the spiritual world. Those who seeing the fallen condition and suffering of the living entities in this world come out of their own compassion. And there are those special souls who are chosen, and deputed by the Lord Himself, they receive an order from Krishna – “You go to the material world and preach Krishna consciousness.” One such personality is our beloved Srila Prabhupada. He recounted one time in a moment of intimacy, how the Lord instructed Him to come. He said that “I am not very used to austerities” he said to the Lord and the Lord said, “Don’t bother. You go down and just write, translate books on the science of Krishna consciousness and I will arrange everything else for you.” which He did. So this is the definition of avatar – when one who descends from the spiritual world. So it is very significant to note that this primary name of the Lord, the original name, or the most important name according to Krishna, comes as an avatar. More specifically Srila Krishnadas Kaviraj Goswami says, author of Caitanya Caritamrta, which was Srila Bhaktisiddhanta Saraswati’s favourite book, kali-kale nama-rupe krsna-avatara nama haite haya sarva-jagat-nistara (CC Adi 17.22) In this Age of Kali, the holy name of the Lord, the Hare Krsna maha-mantra, is the incarnation of Lord Krsna. Simply by chanting the holy name, one associates with the Lord. Anyone who does this (meaning all of you) are liberated. Now, generally when an incarnation comes to this world, what does he do? That’s a good question! Someone might ask, “When the Lord comes, like, what does He do?” you know, a non-devotee, inquisitive person. Well all questions are answered in Krishna consciousness. This is the beauty of our philosophy. There are no ifs ands buts or maybe’s , there is something you know quasi spiritual. In our movement we have the answers to each and every question, perfect answers, perfect questions perfect answers. So what Krishna does He tells, as Radhanath Swami Maharaj says. “Krishna tells.” Krishna says that Maharaj always says Krishna tells. Krishna tells in the Bhagavad Gita paritranaya sadhunam vinasaya ca duskrtam dharma-samsthapanarthaya sambhavami yuge yuge (BG 4.8) To deliver the pious, one; to annihilate the miscreants as well as to re establish dharma, principles of religion, I Myself appear millennium after millennium. 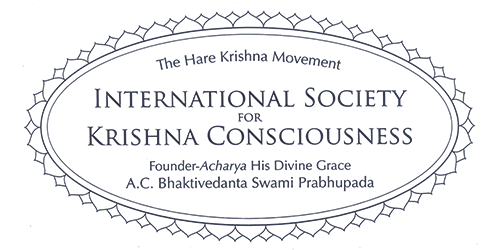 So if according to Kaviraj Goswami the holy name of Krishna is an incarnation in this age, we would expect to see the holy name as an avatar accomplish those three missions of the Lord when He comes to this world. To deliver devotees, to kill miscreants, annihilate them, just don’t kill them, like annihilate them, just like there’s nothing left (laughter) and to reestablish principles of religion like cleanliness, truthfulness, mercy, austerity. So does the holy name do that? Does the holy name first of all deliver devotees? Go look in the mirror. The holy name not only delivers the devotees, the holy name is so kind, the holy name makes devotees, out of those who have no qualification of becoming devotees. This is the special mercy of Sri Caitanya Mahaprabhu, the yuga avatar. That’s for the most part you and me, not our second generation, they are all…Prabhupada said,” the devotees….. the children of my devotees…children of your children will be pure devotees. “ Prabhupada said. They are taking birth all over the world because there is an institution which they can take birth in, become perfected, and help spread the chanting of the Hare Krishna. This is the importance of our gurukula. So take a, look at a photo of yourself before you became a devotee and look at a photo of yourself now. Even though you may be much older and not so attractive, if you compare the two, previously you looked like a Yamaduta (laughter). And Prabhupada said, ‘now that my disciples have joined this movement and they have put on, they have shaved their heads, or covered their heads with a saree, and put on kanthi mala, and chanting, they look just like they have come from Vaikuntha. “ So yes, paritranaya sadhunam the holy name rescues the devotees. And does the holy name annihilate the miscreants? Well, Prabhupada gave an interesting interpretation on this, or angle of vision. He said that, “the holy name is so merciful that it doesn’t destroy the person, but destroys all his bad qualities, by ceto darpanam marjanam, by purifying the heart.” So this is, therefore Rupa Goswami says, namo maha-vadanyaya krsna-prema-pradaya te krsnaya krsna-caitanya- namne gaura-tvise namah ( CC Madhya 19.53) There is no more merciful incarnation than You, Caitanya Mahaprabhu. Prabhupada said one time here in Mayapur, ‘ The Lord is, Lord Caitanya is so kind, He doesn’t take into consideration our offenses, He only takes into consideration our service.” And does the holy name reestablish religion? Well, like I said, religion, the fundamental principles, the foundation of religion, by which we can become purified, and thereby awaken our love for Krishna. The principles of religion are cleanliness, truthfulness, mercy and austerity, practically non-existent in Kali yuga. Just a little bit of truthfulness by which people can appreciate this Krishna consciousness movement. But by becoming a devotee you become clean inside and out. You become truthful, you always speak about the Absolute Truth, Krishna. Mercy, we all practice mercy. The distinguishing characteristic or quality sadhava sadhubhushanah, of a devotee who has all good qualities or manifests all good qualities is his compassion for the sufferings of others. Other transcendentalists, with all due respect, they are more or less concerned with their own deliverance. But a devotee he is not happy to go back to Godhead alone. He wants to rescue as many fallen souls as possible or take them back to Godhead. So cleanliness, truthfulness, austerity and mercy. No ones more merciful than a Vaisnava, chadiya vaisnava seva, Narottama says, who has ever been delivered, who has ever achieved liberation from this world without the mercy of a Vaisnava? So Vaisnava’s are the embodiment of compassion. This is all accomplished by chanting Hare Krishna Hare Krishna Krishna Krishna Hare Hare, Hare Rama Hare Rama Rama Rama Hare Hare So this incarnation, this maha-mantra appeared from the lotus lips of Caitanya Mahaprabhu 500 years ago and slowly spread around Navadvip and Mayapur. Then Mahaprabhu spread it to South India but His desire was that this holy name would go to every town and village of the world. Why? Because Krishna is the seed giving father of all living entities. He is not just the God of the Hindus! No! All living entities, even the bugs and the germs are Krishna’s devotees. George Harrison said, “Everyone is a devotee of Krishna. Some know it and some don’t.” George Harrison, Bhakta George. “Everyone is a devotee of Krishna. Some know it and some don’t.” So this holy name was meant to go beyond the borders of India and go to the Western world. And its been busy doing these three things since 1965, an important moment in history 1965 when Prabhupada brought the holy names to the West. One time Prabhupada said in London, “ if it weren’t for the Hare Krishna movement, you could not imagine how a deplorable condition this world would be in this moment.” That it is, but if it wasn’t for the chanting, the congregational chanting, Hare Krishna Hare Krishna Krishna Krishna Hare Hare, Hare Rama Hare Rama Rama Rama Hare Hare This was all due to the chanting of the holy name which in every circumstance purifies everything. We used to sing on the streets in the old days, you know. We’d sing the mantra, but we were new devotees, we would sing songs (laughs) sometimes to glorify the Lord. One of my God brothers Mangalananda was very expert at writing songs and he’d come with a song that streets in Cleveland Ohio, or Detroit in 1970, 1971. He had one song, Changing the face of the earth Giving her people new birth Turning our eyes to the spiritual sky Telling us what life is worth. It’s true. Holy name is changing the planet, all these trends that are popular these days, vegetarianism, the belief in karma, so many things. This is really due to the propagation of the sankirtana movement. Meaning holy names, prasadam and Srila Prabhupada’s books. People are trying so many complex and radical ways to solve the world’s problems. Problems like war, environmental destruction, crime, mismanagement in government. But the key according to this verse where it says that all problems are solved by devotional service which means chanting Hare Krishna, the key to solving these problems is chanting the holy names. I remember one time we were in London and Prabhupada called my God brother Bhagavan dasa to his quarters and he said, I heard him say it. He said to Bhagavan dasa, “You should write a book on how Krishna consciousness can practically solve all the problems of life like crime and hunger and famine and mental problems and drug problems.” He said like that. He said, “You can call the book, what did he say, ‘Spiritual solutions to material problems’.“ and Prabhupada himself would have discussions like that. There is that chief police, chief of police in Chicago, I think his name is officer Daley or something, I forget. And Prabhupada talked to him about how chanting Hare Krishna can solve the crime problem. And the officer said like how? Because Prabhupada said when you are satisfied in your heart you don’t become greedy for things that you don’t need. So if people chant Hare Krishna Hare Krishna Krishna Krishna Hare Hare, Hare Rama Hare Rama Rama Rama Hare Hare They will be so satisfied spiritually within they can live with the basic necessities of life. We could go on for hours like you know how chanting Hare Krishna can solve practical problems of modern society but I only have ten minutes left. But this is a challenge for some skilled devotee author to write a book ‘Spiritual solutions to material problems’. But from the Absolute platform we can say that the process of Krishna consciousness, chanting Hare Krishna eventually does solve all problems of life because by chanting Hare Krishna you go back home, back to Godhead. (laughs) and whereas this world is temporary, full of suffering and ignorance, the spiritual world is just the opposite, its eternal, full of knowledge and bliss. Where this world is characterized, Krishna says an intelligent person, he can perceive the evils of this world, which Krishna describes as birth, disease, old age and death. But these things are conspicuous by their absence in the spiritual world. So really we can say with full authority that by chanting of Hare Krishna is the panacea, panacea is a powerful word that means a solution to everything. They have been looking you know, for two things, from time immemorial – the fountain of youth and the panacea, the solution to all problems of this world. That’s chanting, Hare Krishna Hare Krishna Krishna Krishna Hare Hare, Hare Rama Hare Rama Rama Rama Hare Hare One single stroke, Prabhupada said, one stroke all problems solved. One time a devotee asked Prabhupada, “when we get back to the spiritual world, do we remember the time spent in the material world?” So Prabhupada paused, closed his eyes and thought for a moment and he said, “Yes you will remember your sojourn through the material world like a bad dream, like a nightmare.” He said. Just like sometimes you wake up at night because you had a bad dream, a nightmare and your tendency is not to go back to sleep, for fear of having the same dream again. So Prabhupada said, Krishna says, punar janma na vidyate, once you attain My abode you don’t come back. This is one of the reasons, you compare the two. I am not going back there, I am not going back to New York or London or Sydney or Kiev or Moscow, now that I am in Sri Vrindavana dhama. So the whole world can benefit from this primary name, the original name of God. Therefore we should distribute it. Chanting means more than japa retreats and kirtan mela’s. That’s nice for devotees. But really this holy name descended for a specific purpose, that is to flood this planet, every town and village with the chanting of, Hare Krishna Hare Krishna Krishna Krishna Hare Hare, Hare Rama Hare Rama Rama Rama Hare Hare Bhaktisiddhanta Sarasvati Thakura at one initiation lecture in 1931, he said, “This, distribution of these holy names, this preaching would do good for the preacher and for the people who hear the preaching.” So we have a powerful tool to extradite ourselves from the entanglement of material existence and save the world. And the idea is that this, by going out and distributing this holy name, it has a domino effect. You know domino effect. You probably don’t play dominos. I don’t even know how this expression came about. The domino’s those little black you know wooden pieces and they have little white dots on them. If you line them all up, its is an interesting phenomenon, you push one and tododo..tododo..tododo, the domino effect is all the dominos fall down. So the domino effect of any devotee according to their means, according to their abilities in preaching Krishna consciousness is that it makes other devotees. There is a beautiful verse underlining this principle in the Brhad Narayana Purana, that’s a nice Purana. Purana means very old, we usually quote harer nama harer nama…but I found another very beautiful verse in the Brhad Narayana Purana which underscores how the holy name will spread, the domino effect. And that verse is as follows, and you will love it, “Chanting the holy name constantly can purify even the most fallen sinner. And after he becomes purified, he in turn is to be counted amongst the saintly persons who can purify others by his association.” Isn’t that nice? I love that verse. So all this is accomplished by chanting. Therefore although we sing many bhajans and many names of the Lord, mainly we should chant Hare Krishna Hare Krishna Krishna Krishna Hare Hare, Hare Rama Hare Rama Rama Rama Hare Hare Its more powerful than all the other holy names combined. This is just understanding, refining the science of chanting. All names are important to us but we have been initiated into the maha-mantra. 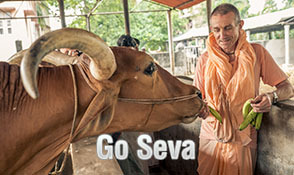 It’s the mantra we have been given by our Guru Maharaj and it takes us to Goloka Vrindavana. In his Krishna Sandarbha, Srila Jiva Goswami, write and I quote “Krishna is the original name of the Lord and all other names are simply part and parcel of the original name of Krishna. The original name Krishna is more powerful than the other names and the result of chanting the name of Krishna is greater than that of chanting all the other names of the Lord together.” So when we hear these glories of the holy name it is meant to increase our sraddha or our faith. 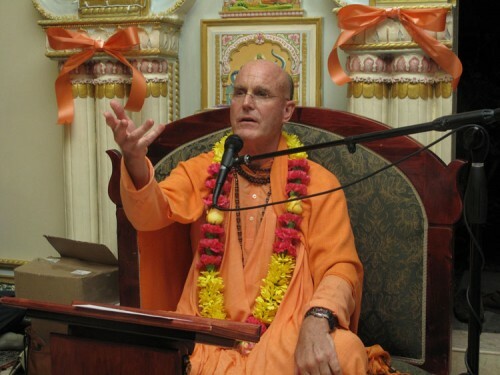 It is meant to help us devlelop nama ruci, so that when we sit down we chant as Sacinandana Swami tells us, with the three P’s – Posture, Pronunciation and Prayer. Prabhupada said, “sit properly!” (laughs) and pronunciation, not too fast to finish. But to savor and glorify the Lord and with some feeling. We may not have bhakti, we can be honest. But we have appreciation – Guru Maharaj, Mahaprabhu, Radha Krishna have delivered me from the ocean of material existence. We have that appreciation, eventually through the process, appreciation turns into affection and affection evolves into love. So we are on the right path, we are on the path of pure devotional service. One time Prabhupada said, “all my disciples are pure devotees.” Because we are on the path of pure devotion. So these discussions are meant to increase our faith in the holy names and none of, anything I have said is not an exaggeration. These are not statements by sastras or acaryas to trick us into chanting Hare Krishna. It’s the transcendental truth. We have to have faith. It’s so important. The amount of faith you have will determine the value, the benefit of your constant chanting. Skanda Purana encourages this faith. The Skanda Purana says, “ I see that Kali yuga is like a black poisonous snake with a gaping mouth and fangs. But please be unperturbed my dear devotees, and listen with faith. Once the holy name of the Lord is chanted it is like igniting a forest fire which will burn to ashes the poisonous snakes within the forest.” So in order to advance properly in Krishna consciousness we have to be conscious of the unlimited good fortune we have inherited. What is the most valuable possession we have? What our Guru Maharaj has given us Hare Krishna Hare Krishna Krishna Krishna Hare Hare, Hare Rama Hare Rama Rama Rama Hare Hare Sometimes we just have to step back for a moment and analyze what we have. Because very often we make the mistake of taking our good fortune for granted, familiarity breeds contempt. All too often we are lamenting for what we don’t have. But better to stand back and appreciate what we do have. Remember how fortunate we are to have been blessed with this chanting of Hare Krishna, which will not only solve all our problems, it will bestow upon us love of God, which is the ultimate benefit of chanting. So Rupa Goswami advises us again in his Padyavali how to appreciate this good fortune. He says, “O Lord! Just as a miser continually collects, counts and remembers money. In the same way lets us devotees continually collect, count and remember Your holy names. “ Sometimes devotees lament, they get discouraged, they get depressed that no matter how hard it gets, no matter, what’s the common saying –life throws at you – we can always be inspired by remembering the list of our good fortune. Like they have what’s called a wish list. But the karmis are so crazy, the ten things to do before you die – go to Disneyland, visit the Pyramids of Egypt, like what! So we have our list, we are on the path of devotion, adau sraddha tatah sadhu- sango ’tha bhajana-kriya tato ’nartha-nivrttih syat nistha ruci bhava prema We have our, these are our road signs and we want to know where we are and what’s the next step, you know. And we have the means to achieve that, to extradite, we have the tools to extradite ourselves from the jungle of material existence. We have been blessed with certain items that are very dear to our heart. So we have no reason to lament. Like Raghunath dasa Goswami, he made a list of his good fortune. And his list should be our list of good fortune. Like he says in his Manah Siksa famously, what is his list, “O mind! I grasp your feet and beg you with sweet words. Please throw away all your pride and develop intense and extraordinary love for my spiritual master, Braja bhumi, the people of Braja, the Vaisnavas, the brahmana’s, the Gayatri Mantra, the holy names and the transcendental shelter which is the youthful couple of Braja.” This we all possess being members of the International Society for Krishna Consciousness by Srila Prabhupada’s grace. So we have to sometimes just take a little time off and reflect. That is the advise of Bhaktivinoda Thakura. He states the following, “ The devotee should make it a regular practice to spend a little time alone in a quiet place and concentrate deeply on the holy names. He should utter and hear the name distinctly. It is impossible for the jiva to single handedly avoid and overcome the illusion of distraction. But by the mercy of the Lord however this is accomplished with ease.” And what is that mercy? The name itself, Hare Krishna Hare Krishna Krishna Krishna Hare Hare, Hare Rama Hare Rama Rama Rama Hare Hare Certainly Bhaktivinoda Thakur was one such person who had that sraddha, that faith in the name. In chapter one of Harinama Cintamani, he writes, “My dear Lord, my only hope lies in the limitless nectar of your holy names.” And what type of chanting does he recommend? He recommends the type of chanting that Mahaprabhu recommended, kirtaniya sada harih, always chanting, or as Prabhupada paraphrased it –“ If you’ve got time chant Hare Krishna.” That’s also an instruction of Prabhodananda Sarasvati, in his Caitanya Candamrta, he says, “O sadhu! If you cannot suddenly renounce this dream like world, then day and night meditate on Vrindavana, worship Vrindavana’s king and queen and always chant their holy names.” So we should arrange things, we should arrange our life in such a way that we don’t become overburdened with unnecessary things and so our whole life revolves either around chanting the holy names or distributing the holy names to others. This is the Internationals society for…this is our business. To get up in the morning and chant, to join the congregation of devotees and chant and somehow assist the sankirtana movement. It doesn’t necessarily mean you have to go out and practically distribute the books. You can raise children, that’s a long term investment, but absolutely required. The next flood of ecstasy will be our children and their children. Or you can build beautiful temples that after people read the books, how do I practice Krishna consciousness, I don’t know what to do! Come to the temple! Or you can open restaurants! Or you can just have a Namahatta in the middle of nowhere and invite your neighbours over. There’s so many varieties of ways for sanyasis, and vanaprasthis, and grhasthas, and brahmacaris, to preach Krishna consciousness, but this is really the mood of ISKCON, all together now. All together now. Sankirtana means the complete glorification of the Lord and everyone should be engaged under good leadership to know the importance of chanting and our responsibility as the modern day representatives of the Gaudiya Vaisnava tradition to loudly broadcast, Hare Krishna Hare Krishna Krishna Krishna Hare Hare, Hare Rama Hare Rama Rama Rama Hare Hare This is the advise of Srila Bhaktisiddhanta Sarasvati Thakura. In his purports to the Sri Caitanya Siksamrta he writes, “In the teachings of Sriman Mahaprabhu, there are only two principle instructions. Develop a taste for chanting the holy names and display compassion for the fallen souls.” I will read that again, “In the teachings of Sriman Mahaprabhu, there are only two principle instructions. Develop a taste for chanting the holy names and display compassion for the fallen souls.” So we are blessed with the original name, chanting the original name and this formula will save us and its so powerful it can save the world. One time Prabhupada said in London, “One day scholars will note how this Hare Krishna movement saved the world in its darkest hour.” And what does it mean to be saved? Brhad Narayana Purana states, “ The extraordinary result derived from chanting the transcendentally empowered and eternal name of Krishna just a few times, cannot be satisfactorily described even by persons like Lord Siva or Lord Brahma. So marvelous is the holy name that immediately upon chanting the chanter attains the supreme destination.” And that means all problems solved. Hare Krishna! Thank you very much! Srila Prabhupada ki jaya! Granthraj Srimad Bhagavatam ki jaya! Gaur premdhana Harinama sankirtana yajna ki jaya! Hare Krishna!